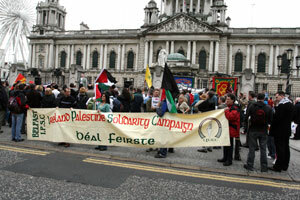 THE call for freedom for Palestine was heard in Belfast and Derry last week. Al Nakba, or ‘Catastrophe Day’ as it is known by Palestinians marks the day when the state of Israel was proclaimed in May 1948, following which some 846,000 Palestinians were immediately driven from their lands. The new Israeli Government permitted very few Palestinians to return home and by 1950, over one million Palestinians were living in UN-supported refugee camps in Gaza, West Bank, Lebanon, and Jordan. In the years since Al Nakba the region has never known peace and since September 2000 more than 5,000 Palestinians and 1,050 Israelis have died in the ongoing conflict. Al Nakba was marked on Wednesday, 14 May in Derry when Feile 08 and the Palestinian Solidarity group invited people in the Bogside to show support for Palestine with a demonstration at Free Derry Wall. The following Saturday, in another show of solidarity with the Palestinian cause, 200 people from all shades of political opinion took part in a march to Belfast City Hall that called for the right of return of exiled Palestinians to their homeland and an end to the siege of Gaza. Among the speakers was Patricia McKeown, of the trade union Unison, who called for a boycott of Israeli goods. “We are not apologetic about calling for a boycott of Israeli goods and for divestment from companies that profit from the misery of the Palestinian people,” she said.